The great thing about the Internet is that you find things that you are not even looking for. 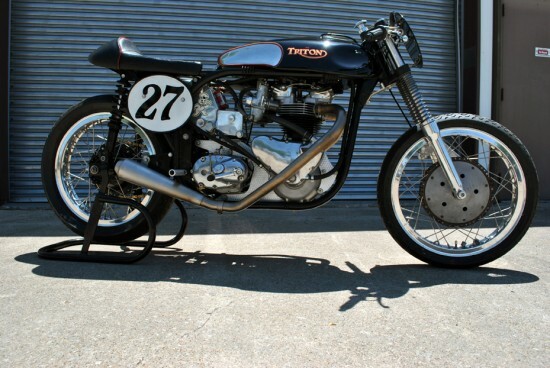 This is the case with this 1958 Triumph Triton offered up on eBay now. I was minding my own business when another blog I follow said to go look at this bike (sound familiar?) so I went, and eye candy is really how to describe what was found. Up for auction is this Triton race bike, built personally by Keith Martin, owner of Big D Cycle. The frame is a 1958 Dominator featherbed, and the motor a 650cc Triumph pre-unit. Only the best components were used to create this competition machine. 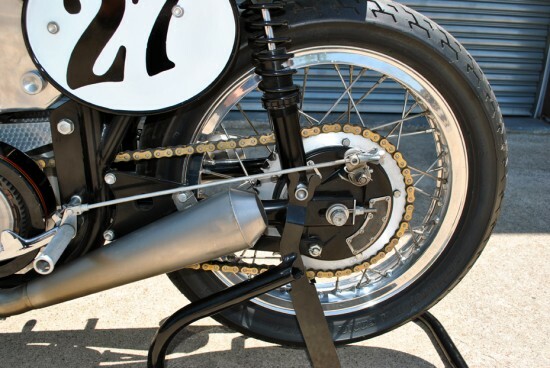 It was intended for AHRMA’S classic 60’s 650 class, and other similar vintage road racing categories. This is a fully functional motorcycle; it only needs gas and oil. Currently it is drained of fluids and has been on display. The gas was made by Evan Wilcox, and is of the utmost quality. The stock primary drive has been removed in favor of a Bob Newby clutch and belt drive. 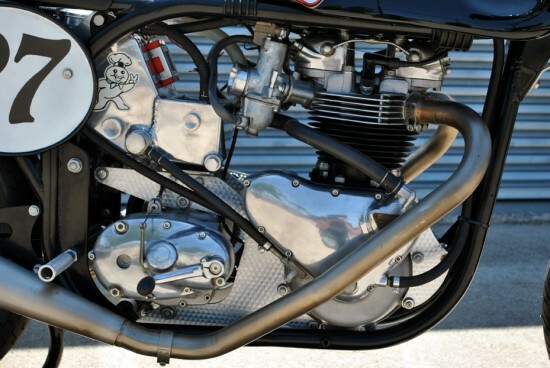 The exhaust was handmade of stainless steel and is a one off. The front brake is an Oldani replica. The wheels are Excel 18’ shouldered aluminum front and rear. The ignition system is an electronic Boyer running off total loss. The oil tank is also the catch can, and a battery tray that accepts a Yuasa YTX5 battery. 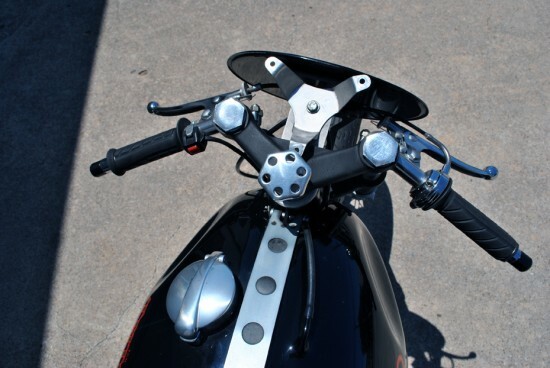 Rear brake is a Triumph conical type. The shocks are Works performance. Yes, Tritons have been done 896743948 times before; however this is an extremely nice Triton. It has only been on track one time, and then it was prepared for display. This bike was meticulously perfected by Keith himself, and is sure to bring a new owner much joy on the track, or on the street if converted to street legal status. This bike has a clearTexastitle. We will ship this motorcycle worldwide (except to the countries listed on our exclusion list, please click the shipping tab above this description for more information). We can handle domestic shipments; International shipping arrangements will be the responsibility of the winning bidder. As you know if you are looking here the Triton was never manufactured, but it was born of a Norton Frame and a Triumph engine. Back in the day when you went to a wrecking yard to fix your bike, British enthusiast either went to the wrecker to get an engine for their blown Norton, or a frame for their poor handling Triumph. 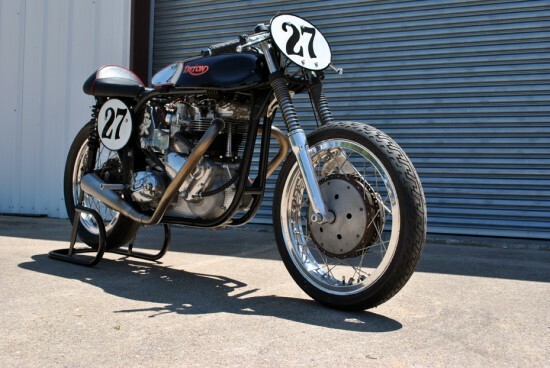 Those people looking to go faster on the cheap (really I’m sure it was never cheap) would get the best handling frame, the Norton Featherbed, and the engine with the most potential, a Triumph. What you got was a Triton. The seller doesn’t give a lot of the finer details on the engine build, but what I can pick up from the pictures, shows a nice, put together bike. Dual Amals on what could be a Delta Bonneville head. Larger capacity oil tank with integrated battery tray. Twin Leading brake up front and vented rear brake. Beutifly turned engine plates, rear sets and Manx style seat and tank and reverse cone muffler. That is absolutely STUNNING! Wow. I pretty much never think of owning anything that doesn’t have at least one disc brake up front, but this totally triggered the saliva glands. Gorgeous. Absolutely gorgeous.